My new article on the Nesting blog is up. 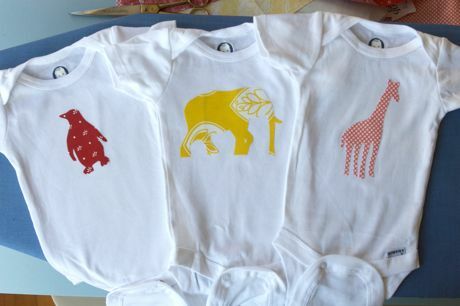 It shows how to make iron on onesies. This project is very easy and is perfect for baby showers. such a cute idea! my little one on the way needs the giraffe! Love these! Such a simple, graphic design, and so sweet! sometimes my iron ons come off in the wash so it's helpful to make a few quick stitches around the perimeter of the shape to hold it more permanently. These are darling! The possibilities are endless… tote bags, bibs, jeans, placemats… Nice job! These turned out so well! My favorite is the giraffe. Jordan I love this! I ran out of time and had to order mine off of etsy for the shower. But yours are darling!! Mother of three and a half (pregnant), used to be a graphic designer and somehow lost all creativity through the years. I have been needing a creative touch in my life again and am TOTALLY inspired by you! I just went though almost a year of your blog and I am off to design. Thanks for all the inspiration!! What a wonderful idea!! I can't wait to host a baby shower so I can do this! i may just make myself a polka-dotted giraffe tee. Awesome, thank you for the tutorial! I want/need to do this. great DIY post! these are very cute. So cute! I cant wait to make some. LOVE the idea! Much better than the puffy paint onesies I had at my shower (while cute, difficult to wash and uncomfortable for baby to wear). 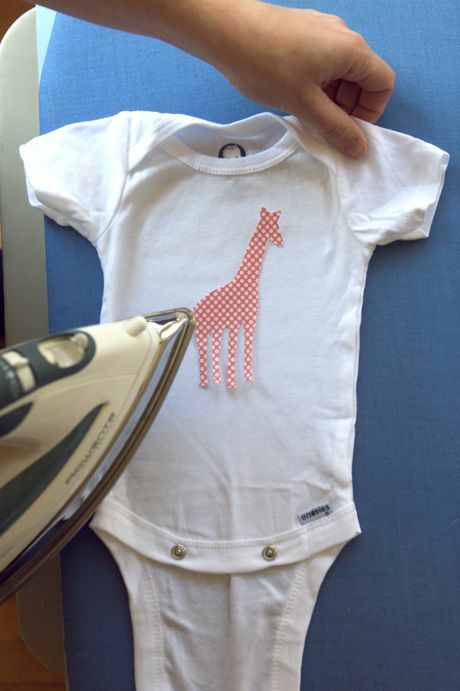 Question: does the iron on material make it so that you have to wash/dry the onesies in a special way? Oooh this makes me happy. I will have to try this. Thank you for this idea. I just bought the iron on materials to get this started! this is sooooo cute!! I am going to try it!! We made these at a party the other night & I couldn't believe how cute they turned out even the ones the kids made were perfect! I can't wait to try this! Just on my kids tshirts. What a great idea for a shower! So unique and I bet really fun to make! I never knew iron-ons were so easy! This is the perfect idea for a baby shower, or gift for a new mom. Thanks for the fantastic step-by-step, Jordan! I feel silly asking this, but I live abroad and have no idea how to describe iron-on fabric in German. If I were to purchase this online, where would I find a good selection? I have a new nephew and am heading home to CA in 3 weeks, so I could send myself some to take back with me. I love these and am hoping to use the idea for a baby shower! I can't seem to access the tutorial and am redirected to the conde nast website. Anyway I can get the directions e-mail or republished on the blog?! I agree with Kara – I'd love to make these, but the links are going nowhere. Any way you could re-publish? Thanks in advance!